Cicadas have an air of mystery about them because they disappear for years, only to reemerge, mate and die. Of the approximately 150 species of cicadas in North America, only seven species have synchronized development and periodical emergences. Four species have 13-year life cycles and three species have 17-year life cycles. The vast majority of cicadas don't disappear for long spells, only to reappear more than a decade later in a perfectly timed reemergence. Most cicadas are called annual cicadas because they appear as adults every year. Whether the cicada is periodical or annual, the purpose of the emergence is the same: to mate and die. The basic cicada life cycle is the same, regardless of the species: the adult cicadas mate in late spring or summer. The female finds a tree she likes, makes a slit in the bark of a branch and releases up to 600 fertilized eggs. It takes about six or seven weeks for the eggs to hatch, releasing wingless larvae, otherwise known as nymphs. The nymphs drop to the ground and burrow 18 to 24 inches into the soil, where they attach themselves to the tree's roots. What Are They Up To Down There? 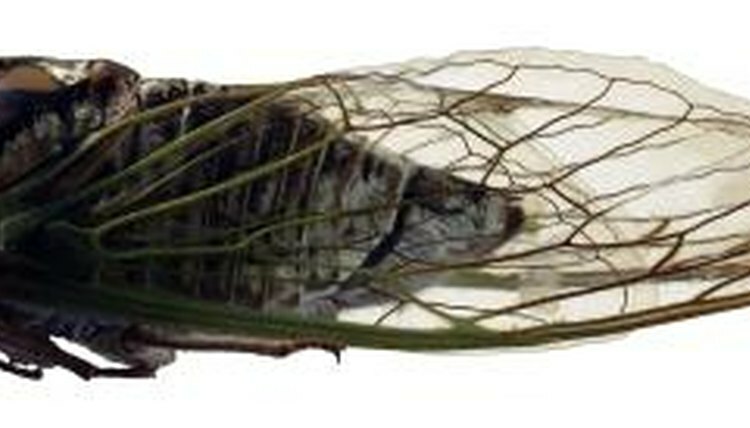 Most nymphs spend a year down below, attaching themselves to the tree's roots, feeding from the sap. If he's an annual cicada, he'll come above ground and complete his final molt, transforming into a winged cicada. He'll attract female attention by making music with his wings -- the clicking and buzzing people hear. Periodical cicadas, however, spend much more time underground, either 13 or 17 years, depending on the species. During their decade-plus under the soil, they go through five juvenile stages, changing from the size of a small ant to almost their full size of about 1 1/2 inches long. When the periodical cicada emerges, he does the same thing his annual relative does: molt, mate and die. Depending on where you live, you may experience periodical cicadas more than once every 13 or 17 years. There are 12 different 17-year "broods," or groups of cicadas and four different 13-year broods in various regions of the U.S. Each group will emerge when its reached its maturation process underground. Occasionally, "stragglers" are reported, meaning a few cicadas emerge a year early or behind schedule. It's rare for thousands of stragglers to emerge. When the brood begins to emerge, one acre of land can host tens of thousands to more than 1 million cicadas.